WASHINGTON - Six distinguished composers, each of whom made outstanding contributions to the world of music and entertainment, will be commemorated next month by the U.S. Postal Service with the issuance of the Hollywood Composers stamps. 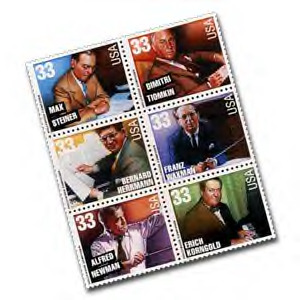 Max Steiner, Dimitri Tiomkin, Alfred Newman, Bernard Hermann, Franz Waxman, and Erich Wolfgang Korngold are featured on the pane of six 33-cent stamps. The stamps will be available in Hollywood, Calif. Sept.16 and at post offices nationwide beginning the following day. The ceremony will take place at 10 a.m. at the famed Hollywood Bowl during a rehearsal of the Hollywood Bowl Orchestra, conducted by John Mauceri. The orchestra will perform songs by each of the composers honored on the stamps. The event is free and open to the public. "The Postal Service is proud to honor six innovative composers whose dramatic musical scores have made a lasting and indelible contribution to the way Americans seeand hearmotion pictures," said Postal Board of Governors member Tirso del Junco who will be the dedicating speaker. "Their music has added to the richness of our culture over the years. Using the power of music to help bring films to life, these talented and award-winning composers will live in Americans' hearts forever with scores such as Gone With The Wind, and Camelot." Joining del Junco at the ceremony will be Los Angeles Postal District Manager Al Iniguez. Max Steiner was a pioneer of Hollywood composing. His legacy is best exemplified by his innovative score for the 1939 movie Gone With the Wind. He provided music for more than 200 films and won Academy Awards for The Informer (1935), Now Voyager (1942), and Since You Went Away (1944). Prior to writing film scores, Dimitri Tiomkin was a concert pianist. He eventually won oscars for High Noon (1952), The High and the Mighty (1954), and The Old Man and the Sea (1958). Tiomkin's most lasting innovation was his use of a title theme that recurred throughout a film. He is best remembered for his work on westerns. Alexander's Ragtime Band (1938), The Song of Bernadette (1943), Love is a Many Splendored Thing (1955), The King and I (1956), and Camelot (1967). In addition to his dramatic scores, he is also known for pioneering the Newman System, a method of synchronizing film music that is still in use today. Bernard Herrmann won an Oscar for his hit song in 1941's All That Money Can Buy. He worked with Alfred Hitchcock on several films, including Vertigo (1958), and his distinctive and often unconventional approach is evident in his musical contributions to Psycho (1960). Franz Waxman supported himself as a cabaret pianist in Berlin before moving to Paris and then to Hollywood, where he composed music for more than 200 films. He won Academy Awards for Sunset Boulevard (1950) and A Place in the Sun (1951), and his scores for other popular films include Rebecca (1940), Objective, Burma (1945), and The Nun's Story (1959). Erich Wolfgang Korngold was a child prodigy in the concert halls of Vienna before becoming a Hollywood composer. He stirred audiences with the Oscar-winning scores to Anthony Adverse (1936) and The Adventures of Robin Hood (1938) and often included operatic qualities in his music for motion pictures. The 33-cent Hollywood Composers stamps were designed by veteran stamp art director Howard Paine of Delaplane, VA and illustrated by Drew Struzan of Pasadena, Calif. The Postal Service introduced the Legends of American Music Series in 1993 with the issuance of 15 stamps in three categories: Rock & Roll/Rhythm & Blues, featuring Elvis Presley, Country & Western and Broadway Musicals. In 1994, five Popular Singers and eight Jazz & Blues Singers stamps were dedicated. Jazz Musicians represented the series in 1995 with ten stamps. In 1996, eight stamps were dedicated; four for Big Band Leaders and four for Songwriters. Twelve Opera Singers and Classical Composers & Conductors stamps were introduced in 1997, and last year Gospel Singers and Folk Musicians joined the series. Hollywood Composers, along with Broadway Songwriters which will be issued Sept. 21 in New York, mark the final addition to the Legends of American Music Series.